I have previously explained how Ed Ricketts used a 20X Bausch & Lomb hand magnifier. However, this claim was based purely on a quote from John Steinbeck. 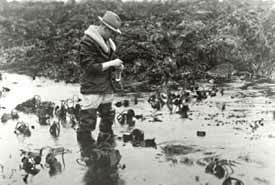 Prompted by a question from Eric Enno Tamm, I have just searched through Between Pacific Tides by Ricketts using Google books and there are 9 specific mentions of using a hand lens to reveal the beauty of what can be seen in the tidepools. Some of these descriptions are poetic - here are some examples. With a hand lens the embryos of Crepidula can sometimes be seen whirling around in their envelopes in the egg packets. Page 85. §62 - Transparent shrimp Heptacarpus pictus. Once captured, the living specimen should be confined in a glass vial not much larger than itself and examined with a hand lens. The beating heart and all the other internal organs can be seen very plainly through the transparent body. ... Though all of these animals are at least visible to the naked eye, and are abundant, characteristic and certainly not lacking in interest, most of them are too small to be seen in detail without a hand lens or microscope and hence cannot be included in this handbook. On the "leaves" and "stems" of outer-tide-pool kelps, one almost always finds an encrusting white tracery delicate enough to be attributable to our childhood friend Jack Frost. But a hand lens reveals a beauty of design more intricate than any ever etched on frosty window-panes. These encrustations are usually formed by colonies of the bryozoan or ectoproct, Membranipora membranacea (Fig 114), so named in the middle of the eighteenth century by Linnaeus, regarded as the founder of modern classification. The minute, calcareous cells, visible to the keen naked eye but seen to better advantage with a lens, radiate in irregular rows from the centre of the colony. ...the process of larval settlement has been described for several species. The process can be watched by any careful observer with a good lens.